Hi again! I hope everyone has had a great month. I’ve mostly been focusing on editor-related tasks, in particular for the Theme Editor, Main Menu Editor, and Credits Editor. At this point I now have a lot of their primary functionality implemented now for v0.5, so it will be nice to move back onto some more interesting features! As mentioned in last month’s update, the new Theme Editor will include support for multiple themes, for example to allow a unique theme for each character, game area, chapter, etc. The video below gives a brief overview of the Theme Editor and shows some of the new settings that are available! The updated Credits Editor also includes some new settings to allow better customization of your game’s credits roll, as well as a feature to preview the credits as they will appear in-game. 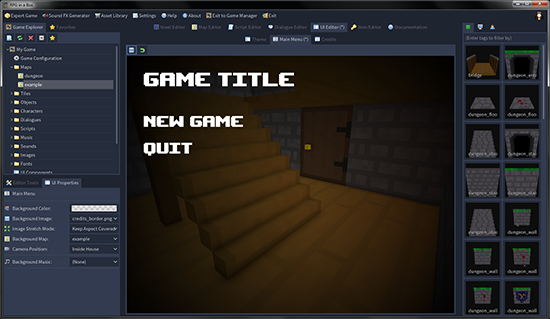 This past week I also finished up the base implementation of the new Main Menu Editor. There’s still some minor work yet to be completed on this editor, but it’s mostly ready to go! To help prepare for the upcoming effort of getting the game engine re-implemented for v0.5, I started creating an improved debug console for testing scripts and such. As with the current version, this will be an option in your game configuration that can be enabled to help debug or test scenarios for your game. The console should be more user friendly and will include a log and command history. Lastly, the Asset Library was migrated over completely, including both the models and music sections. It’s one step closer to the v0.5 release, which I am very eager to share with everyone! 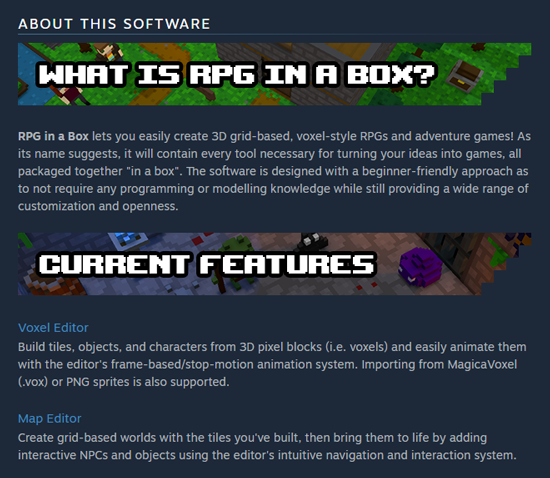 Don’t forget to check out the Trello board for RPG in a Box to follow my development progress in real-time! As always, thank you so much for reading and for your continued support!